DID YOU KNOW...•Scientists believe that mosses, the first plants, may have changed the Earth's climate from hot to cold by removing carbon dioxide from the atmosphere?•Many members of the cabbage family release a poison "mustard" gas to fend off grazers?•Plants are used in thousands of industries, from low-cost sewage treatment to new medical cures?Young nature enthusiasts will learn these and other fascinating facts about plants in this colorful, interactive resource. 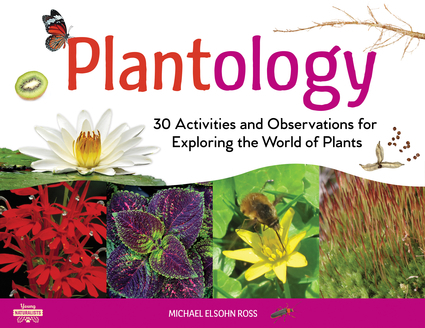 Plantology contains fun, kid-friendly discussions and activities to explore many topics—from seeds, roots, and sprouts to plant skeletons, leaves, petals, and fruits. It then goes beyond the basics to delve into the unknown world of common weeds, fascinating plant defense systems, and the countless roles plants play in our lives. With encouragement to "Try This," "Smell It," and "Look For," kids participate in 30 hands-on activities that promote observation and analysis, writing and drawing, math and science, and nature literacy skills. Children will keep a journal, examine and sketch plant structures, start a seed collection, make tasty vegetarian dishes, and more. Readers from any environment will start to notice the plants around them—not just in parks, gardens, and woods but also surrounding the schools, buildings, and sidewalks of their town, and in their own backyards. Useful resources include a glossary of scientific terms, a list of nature organizations and groups, and a teacher's guide to initiate classroom discussion and investigation. Michael Elsohn Ross is an award-winning author of over 40 books for children, including Sandbox Scientist, She Takes a Stand, Snug As a Bug, and A World of Her Own. He lives and works in Yosemite National Park.